Typically paler the most other oyster mushrooms, and nearly always on old fallen trunks or large branches, the branching nature of these funnel-shaped oysters helps distinguish them from the Oyster Mushroom Pleurotus ostreatus: often several caps share a common stem. 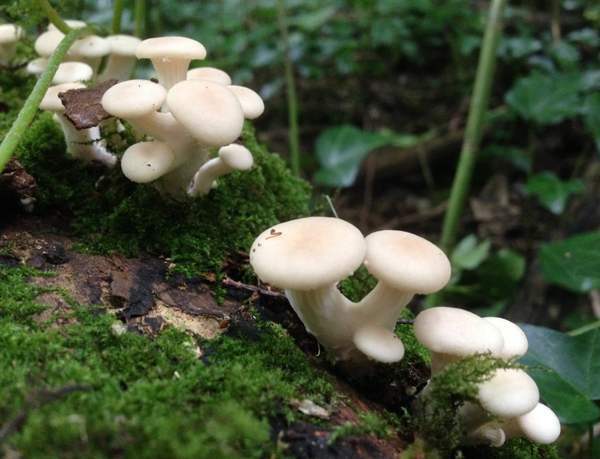 Branching Oyster Mushrooms were a common sight at the height of Dutch elm disease. While they continue to show a partiality for dead elms, they are now most often seen on Beech timber. 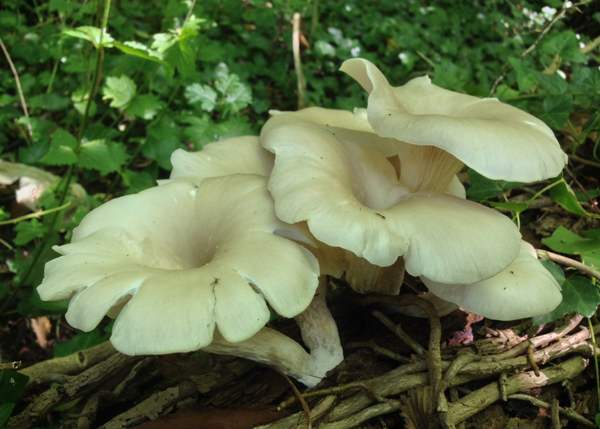 Pleurotus cornocopiae, the Branched Oyster Mushroom, occurs throughout Britain and Ireland, where it is a fairly common sight, as well as in most parts of mainland Europe; its range extends also into western Asia. In eastern Asia the closely-related Golden Oyster Mushroom Pleurotus citrinopileatus is a very popular edible mushroom. 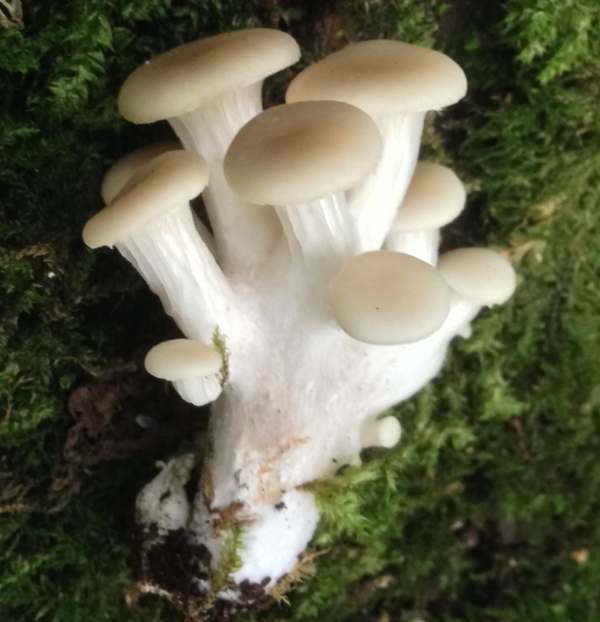 The Branched Oyster Mushroom was first described scientifically in 1793 by French naturalist Jean Jacques Paulet (1740 - 1826), who gave it the binomial name Fungus cornucopiae. Its currently-accepted scientific name Pleurotus cornocopiae dates from 1910, when another Frenchman, mycologist Léon Louis Rolland (1841 - 1912), redescribed this species. Synonyms of Pleurotus cornucopiae include Agaricus dimidiatus Bull., Dendrosarcus cornucopiae Paulet, Fungus cornucopiae Paulet, Agaricus cornucopiae (Paulet) Pers., Agaricus sapidus Schulzer, Pleurotus ostreatus f. cornucopiae (Paulet) Quél., and Pleurotus sapidus (Schulzer) Sacc. The generic name Pleurotus is Latin for ‘side ear’ and refers to the lateral attachment of the stem; cornocopiae means horns of plenty, and indeed these hunting-horn-shaped mushrooms invariably occur in gregarious hordes. The origin of cornucopia (plural cornucopiae) lies in Greek mythology. One version of the origin of Cornucopia (and there are several others) was that it a magical horn that the young Zeus accidentally broke from the head of the goddess Amalthea, who has suckled the child while he was hidden away from his father Cronos (or Kronos), who made a habit of eating his new-born sons to thwart a prophesy that he would one day be overthrown by his son. Zeus survived and did ultimately overthrew Cronos. The horn of Amalthea, the Cornucopia, inherited the goddess's divine power of providing unending supplies of nourishing food. Pleurotus cornucopiae does on occasion provide a bountiful source of food, but on its own it certainly does not constitute a balanced diet and like nearly all wild mushrooms its availability is limited to just a few weeks of the year. 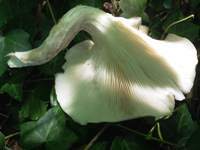 Cream or light ochre; covered in a fine white bloom when young, becoming smooth with age; convex, 4-12cm in diameter at maturity; becoming centrally depressed and then funnel-shaped with a wavy margin that sometimes splits when old; attached to the substrate via an eccentric stem or occasionally appearing to be stemless; groups of caps often overlapping in tiers. White or cream, sometimes with a pink tinge; maturing to pale buff; branching; deeply decurrent, becoming shallow grooves that often extend right down to the substrate. 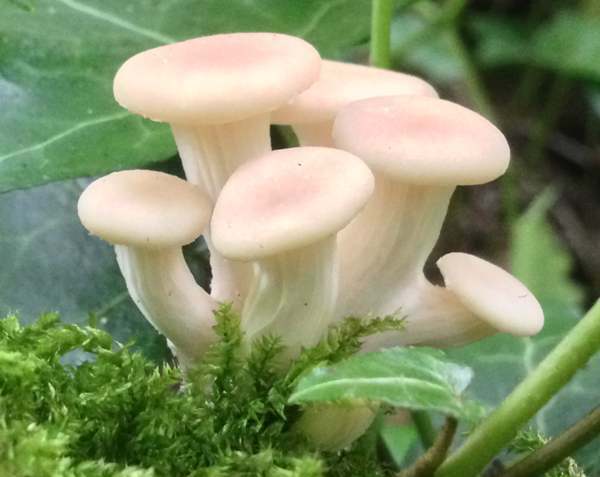 White; up to 5cm long and 1 to 2.5cm diameter, several stems often fused together at the base and sharing a common connection with the substrate; no stem ring. 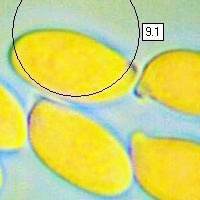 Elongated ellipsoidal to sub-cylindrical, smooth, 7-10.5 x 3.5-5µm. Odour mushroomy, sometimes with a hint of aniseed; taste pleasant but not distinctive. Saprobic, on rotting wood of deciduous broadleaf trees, particularly elms and Beech. Pleurotus dryinus has a frosted cap; its stem has a short-lived ring. 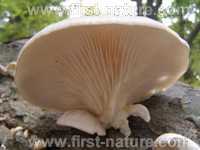 Pleurotus cornucopiae, the Branched Oyster Mushroom, is edible. 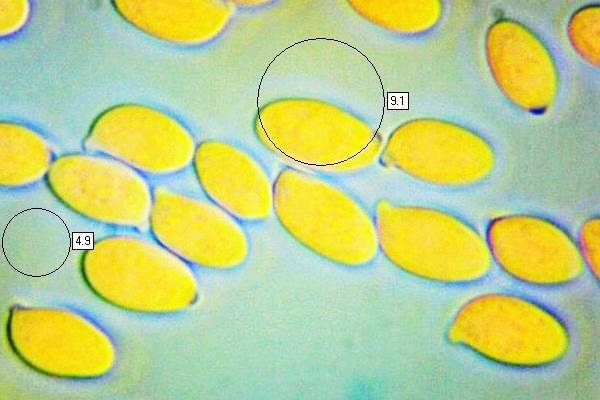 Like its close relative the Oyster Mushroom pleurotus ostreatus it is said by some fungiphages to taste like its bivalve namesake as well as copying its shape; it is similar in texture, too - rather flaccid compared with, say, the more familiar Agaricus species such as Field Mushrooms. We enjoy them in mixed mushroom meals, but on their own the texture of (Branched or otherwise) Oyster Mushrooms is rather limp and certainly not one of our favourite wild mushrooms.